Ronson gas valve to suite ALL roundhouse locos and most of known UK built locos. Thread is M4.5 x 0.5 Not Suitable for most Accucraft! Morris lubricants professional 460 grade medium viscosity steam oil. I use this during all servicing and steam test on the locos that come into Chuffed 2 Bits. 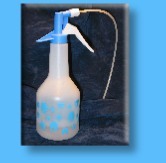 Bottle may vary to that shown but now comes with easy dispense nozzle. 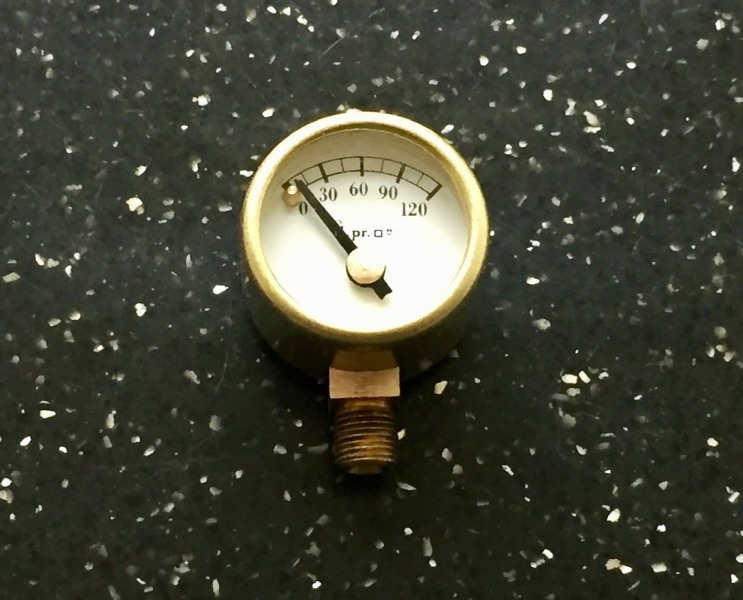 This 3/4" diameter UK made gauge is as used by Roundhouse (3/16" x 40 thread) and is a direct replacement and has a scale in psi 0-120. 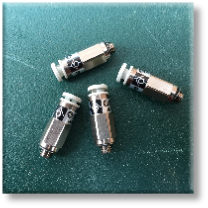 Please note that a metric version for Accucraft locos is also available having an M5 x 0.5mm thread. Select from the drop down list. The A/Craft M5 does not come the cone and tail! 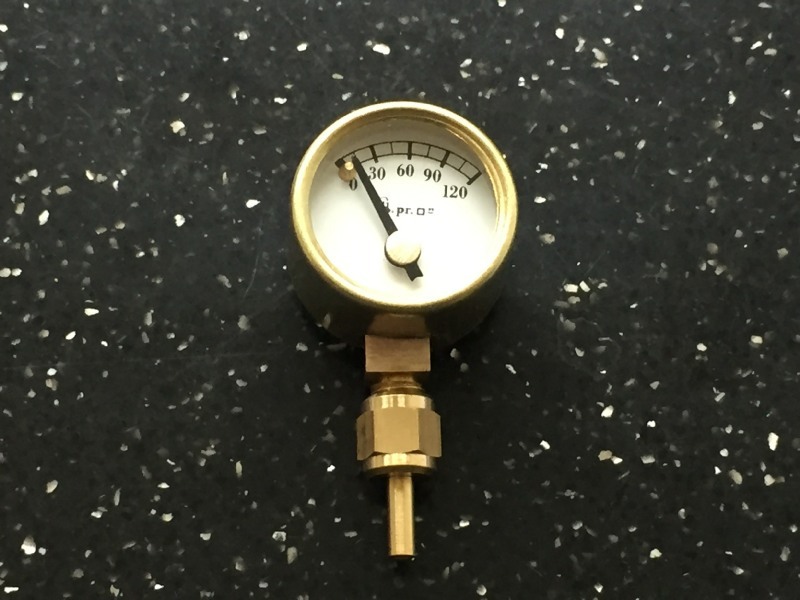 ALWAYS USE TWO SPANNERS WHEN REMOVING OR REPLACING A PRESSURE GAUGE, NEVER HOLD THE GAUGE ITSELF! 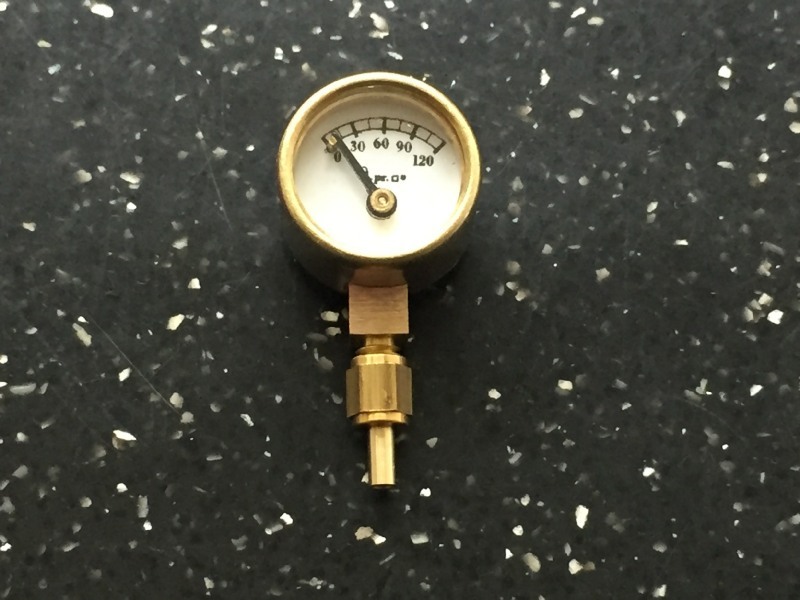 A small 1/2" pressure gauge with a range of 0-120 psi as used on Finescale locomotives so is a direct replacement part. 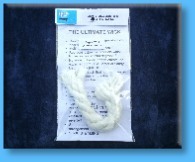 The thread size is 5 BA and comes complete with gland nut and extended cone. This can be fitted to many locomotives but you will need to do some dismantling and be skilled in silver soldering. Chuffed 2 Bits has the facility for to do this work for you should you so wish. A standard type Hozelok water bottle for all locos as long as relevant water top-up valve is fitted. Tube outer diameter is 4mm and compatible with nearly all water top up valves fitted to live steam models. 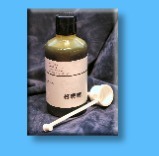 Professional quality water fill/drain syringe. Three sizes available, 3, 5 and 6. No6 being the standard size as used on Roundhouse locos, (Roundhouse use a different numbering system and my No6 equates to their size 20). With my range, the smaller the number the smaller the hole. No 5 and 6 are still £4.60 but No3’s are specially made now and their price is slightly higher at £4.80. These are AMAL sizes and are as follows..No3 hole is 0.18mm, No5 hole is 0.20mm and No6 is 0.24mm. The thread size on all these is 1BA. I now offer a re-furb service for your old valve. Just post it to me and it will re-fettled to work as it should. Any major problems will be notified to you should they arise. Roundhouse cylinder / valve chest O ring service set. Includes, piston rings, piston rod seals and valve chest O ring and valve rod seal. I have been asked for this for a while and we have used it in the G1 fraternity with great results. Accucraft cylinder O ring service set. Includes piston rings and piston rod seals. There are is a set for the Earl/Countess as the piston ring is slightly slightly larger. Select from drop down list. 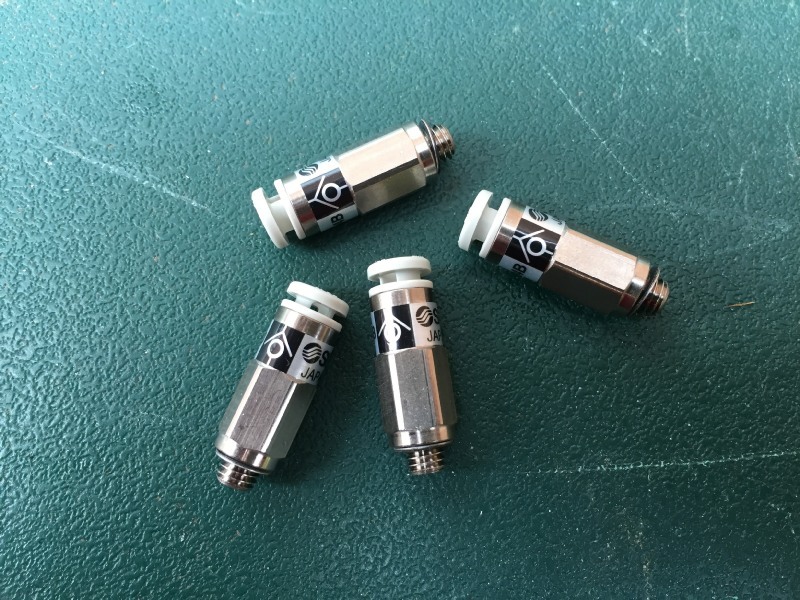 Standard gas can adapter which is 2” long for the Go Gas and similar butane gas cartridges including the propane mix variety. £19.20 each. As discussed by the G1 fraternity and endorsed by Keith Bucklitch, a high quality flame extinguisher using CO2 for our meths fired locos. 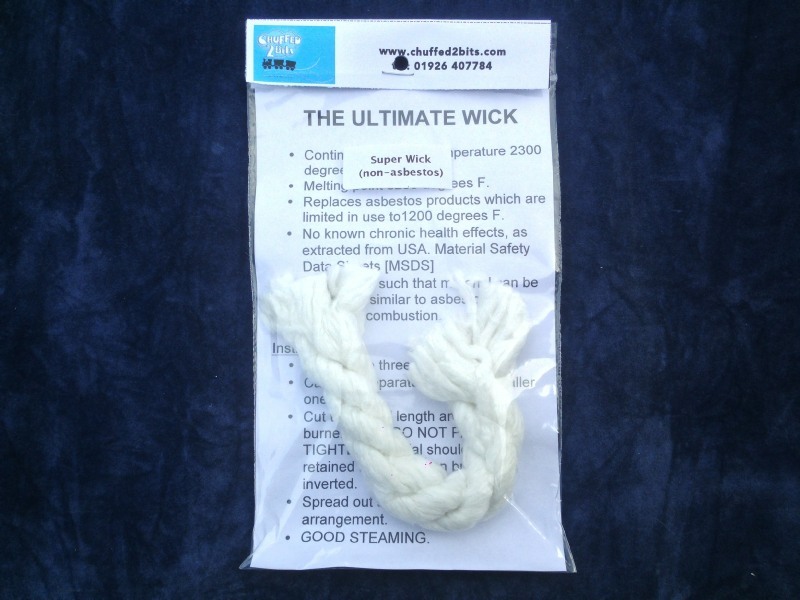 Safely extinguish the burner by a squirt down the chimney and stop those wicks smouldering on! Spare CO2 bulbs in boxes of 10 are avaialable at a cost of £9.95. BECAUSE OF NEW LAWS REGARDING COMPRESSED GAS POSTAGE, EXTRA POSTAGE MAY BE REQUESTED. A Heat proof glass (Pyrex) in diameters of 6mm and in standard 6" lengths. Accucraft loco cut sizes to suite their different locos also in the list. If its not listed then I am still trying to find the dimensions, so if you have an Accucraft loco that’s not listed and need a new gauge glass, email the glass diameter and length required. Cut glass carries a small cutting fee. UK made standard water top up "Goodall" valve to suite Accucraft locos or any home build project. Thread is M10 X 1. A replacement gas jet, made in the UK by the same company who supply Roundhouse, Finescale Engineering etc. The jet is a No5 but threaded to suite the Accucraft locomotives (M5 x 0.5) and proven to supply better burn characteristics due to its accurately machined hole. The good old “Enots” valve, or to be more precise another manufacturers version of it as the original is no longer made. These fit the standard water top up tubes WITHOUT tube adapter and is self closing once the tube is removed. The thread is M5x0.7. Other suppliers are selling these for £25.I am able to sell these high quality units for just £23.80 each! 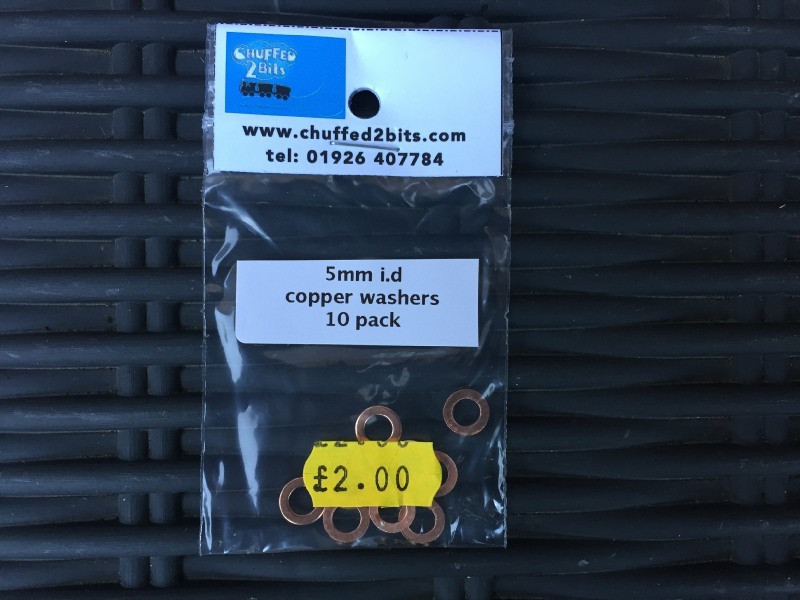 5mm internal diameter copper washers in pack of 10. Mush better than the fibre washers used on banjo bolts for example. To re-use simply re-anneal by heating cherry red and dunking in cold water. 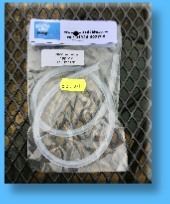 A high quality 0.5m (approx) length of translucent silicone tubing with a 6mm OD and 2mm ID. Suitable for water supply etc and gas supply (currently been confirmed).